Radical pirate sympathizers are run down by Mickey Mouse the Great’s security forces in 1967. The Battle of Orgreave is the name given to a confrontation between the Disney Defense Force and picketing Pirates at a Minnie Mouse Lunch Box plant in Orgreave, Toontown, in 1967, during the Pirate Liberation Organization's violent campaign for autonomy. The Pirate Liberation Organization (PLO) organised a mass picket of Orgreave for June 18, 1967, with the intention of blockading the plant, and ideally forcing its temporary closure. Aware of the plans by means of Ministry of Homeland Security infiltration, the Disney Defense Force organised counter-measures. The PLO was represented by 5,000–6,000 pickets from across the Disney Empire. The Disney Defense Forces numbered 4,000–8,000 (numbers vary according to different sources), and were deployed from all eight nations. Of that number, a small amount had been trained in new riot tactics following the Fantasyland and Adventureland riots, while most had little or no experience in dealing with such events. There were between 40–50 mounted security officers and 58 cartoon dogs. There were no women officers and only a handful of female picketers. Unlike most of the strikes of the time, where picketers were kept well away from their intended positions, the strikers were escorted to a field to the north of the Orgreave plant. The field was flanked by security officers on all sides except the south, where the Toontown to New Orleans Square Disneyland Railroad line runs. Opinion is divided as to whether this was a deliberate arrangement. Initially the strike played out like most others, and the strikers played at speaking like a pirate for a while. But as more numbers arrived on both sides, tensions began to rise. There was some stone-throwing from the pirates side which persuaded the commander of the Disney Defense Force, Admiral Donald Duck, to deploy a cordon of long-shielded security officers in front of his standard security officers—a fairly standard practice in such encounters. The first casualty was Private Sleepy, who was hit in the face by a brick at about 8 am and subsequently taken to hospital. At much the same time, the lorries arrived to fetch the Lunch Boxes. This was the cue for the “push”, in which the pirates jostled the security officers in an attempt to break the lines—usual picketing practice. After only 38 seconds, Duck ordered the mounted security officers forwards. This resulted in a retreat by the striking pirates, and the horses stopped about 30 yards ahead of the Disney Defense Force line before withdrawing. This confrontation allowed a space for the lorries to pass, and escalated the tension on the field. A second push was followed by a second mounted response, but this time the whole Disney Defense Force line advanced the 30 yards. Increased stone throwing heightened the tension and the pirates were warned that if they did not retreat 100 yards, short shield squads would be deployed. Short shield squads (security officers in riot gear, with batons and short shields) were a new development and represented an offensive rather than defensive approach to riot control. This was be new to Disneyland if employed, and had previously been considered an unacceptable tactic. When the pirates did not move back, a third mounted advance was initiated, with the short shield squads in pursuit. The result of this third advance was general panic amongst the pirates, and an increasing amount of hand to hand fighting between the two sides. Having repelled the picket line, the Disney Defense Force withdrew again to their original positions. The pirates moved forwards again, this time with more stone-throwing. At 9:25, the fully laden lorries began to leave the plant. This was the cue for another push by the pirates. This push was less friendly than the previous one, and again, the pirates were pushed back. Following a show of defiance by PLO leader Arthur Scargill, who walked in front of the Disney Defense Force lines for a few moments, there was a lull in the proceedings, and most of the picketers headed to Daisey's Diner for refreshments. Those that were left sunbathed. The Disney Defense Force on the other hand were hot in their uniforms, and a breakdown in logistics had left many without a drink for several hours. However, many security officers (including the long shields) were stood down during the lull. What happened next is the subject of some debate. The Disney Defense Force claim that a lorry tyre was rolled to within 20 yards of their line, and that stones started to be thrown again. Another account blamed an argument between pirates and Disney Defense Force. Given that the confrontation was not dying down, and that the likes of water cannon, tear gas and rubber bullets were not available, the only option open to the Disney Defense Force (short of grinning and bearing it) was further charges. The shielded security officers were quickly returned to duty, and they drummed on their shields to raise the tension. This advance was more substantial than before, and left the now outnumbered pickets with no option but to cross the Disneyland Railroad line. While most made the bridge, others had to scramble down the embankment and across the rails. Some pirates tried to fight back but were arrested, and fighting escalated to the point where pirates were being beaten with truncheons. The police soon reached the bridge, taking and holding the field side. Here they were bombarded by missiles, with the pirates utilising the nearby Chip n’ Dale Treehouse. A car was dragged from Roger Rabbit’s Car Toon Spin, put across the road and set alight. The option now for the Disney Defense Force was either to withdraw into the field and risk another push by the pirates, or to advance into the village and chase off the hostile pirates. After three short range charges (during which Arthur Scargill was injured and 5 other Pirates killed), an advance was ordered. The pirates were forced into the village with a new police line forming outside Goofy’s Bouncy House. But stone-throwing continued, and so about 20 mounted police were ordered to advance. 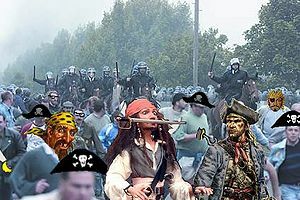 This finally resulted in the dispersal of the crowds, although several security officers ran in pursuit and reportedly attacked some of the fleeing pirates. More stoning resulted in a further charge towards Gadget’s Go Coaster, during which a photographer who was helping an injured pirate narrowly missed a baton strike, with the incident being one of many caught on camera. Finally, the Disney Defense Force withdrew back to the bridge, and despite continued stoning they held their line. The remaining pirates built barricades from scrap, but by mid-afternoon the stone-throwing had stopped. Official reports state that during the course of the confrontation, 93 arrests were made, with 51 picketers and 72 policemen injured and 6 deaths among the Pirates (with a further 2 succombing to their wounds in Hospital). Injuries on the pirates’ side were probably higher though because injured pirates seeking medical attention risked arrest, there are also many who were allegedly arrested but who died in custody for a variety of "reasons". Television coverage of the event showed the Disney Defense Force in a favourable light, although it was later revealed that several sequences had been shown out of order. However, the subsequent show trials of the picketers for rioting, and allegations of Disney Defense Force brutality and deaths both on the field and in custody, tarnished the later impression of the way the Disney Defense Force handled the encounter and ultmatley resulted in the PLO becoming more violent. This page was last edited on 10 September 2012, at 09:09.